2012 has been an awesome year for Yammie's Noshery. Not that I have much to judge by, considering the fact that this has been my first full year of blogging (WOOOOO!! ), but it seems like it's been a success. I mean, don't get me wrong, it's been full of meltdowns and tantrums like any other year, but seriously. I'm really happy I started doing this. I love, love, love all your wonderful, encouraging comments. I love dreaming up new recipes for you and learning more about food and photography with every post. I really love having a creative outlet where I can practice my writing skills (er... rambling skills), and I must thank you for bearing with me as I drag you along through my many weird and random tangents. This year I have amassed 3,793 Facebook followers, 4,642 Pinterest followers, 2,055 feed subscribers, and 443 Twitter followers. I have had 3,950,892 page views (that's almost four MILLION, guys!) and I've made $887.89 on my ads since I started using them four and a half months ago. I never dreamed I would be able to make money on something that was so fun to do, so that is just really way beyond awesome. But it doesn't stop here. There's a lot to look forward to on Yammie's Noshery in 2013. I plan on making lots more gluten-free recipes, more video tutorials, more meals, and maybe even doing a few giveaways. I also want to answer your questions about my photography with a big fat photography post sometime soon and I want to make a nice FAQ page. Now I'm going to give you a list of some of my favorite recipes from 2012 and then the most popular recipes of 2012, which were chosen by YOU. 10. German Chocolate Brownies....and the fact that I posted them on American Independence Day. Patriotic, what? 9. Homemade Twix Bars. Because of their pure beauty. 8. Cheesey Spinach Artichoke Breadsticks. Maybe not the best photos, but they were possibly the most delicious thing I made last year. 7. Caramel Stuffed Double Chocolate Chunk Cookies. It's just... the caramel. It's so beautiful. 6. 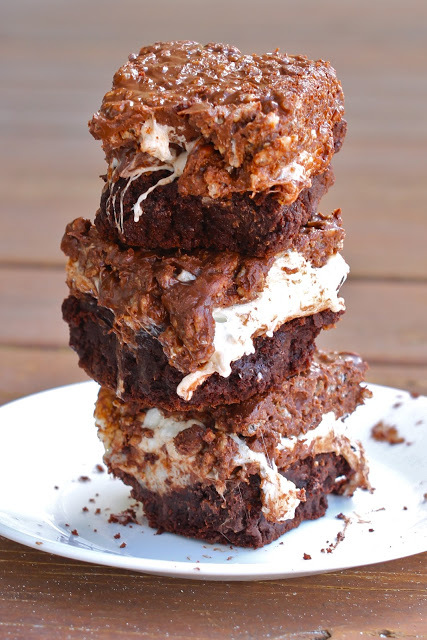 Marshmallow Krispie Brownies. I made these in Florida. I remember going on a long walk down the beach with my sister that day and spending an entire half hour raving about the wonderful symphony of flavor and texture. Sadly, this is no exaggeration. 5. 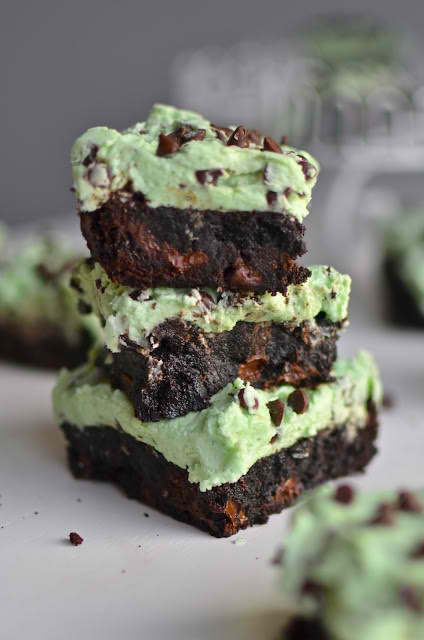 Mint Chocolate Chip Brownies. I know, I'm being biased. I just posted these a few days ago and the memory is still fresh in my mind. What can I say? I love brownies. 4. Herb Crusted Melt-in-your-mouth Pot Roast. It may seem just like an ordinary meal, but it is literally one of my all-time favorite things in the world. It's one of the few meals I actually went to the trouble of making during the light of day so I could photograph it for you. It's just too easy and delicious not to make the list. 3. Pink Ombre Cake. I made this for my friend's bridal shower. I wish I could have kept it forever and put it on a gold pedestal in my room. 2. Chocolate Mountain Cake. A.K.A. my 20th birthday cake! This has already been pinned a few thousand times on Pinterest since I posted it a couple weeks ago. Give it a little longer and it might be one of my top viewed someday. We shall see. 1. Wedding Cake! Made for the afore mentioned friend who now is expecting a baby!!! 10. Flourless Chocolate Torte with White Chocolate Mousse. This was an example of one of those meltdowns I was talking about. But all's well that ends well. 9. K Bars. These also happen to be one of my all-time favorite recipes. Who wouldn't adore these? 8. Brownie Cupcakes with Cookie Dough Frosting. I made these for my blog's first birthday. Aren't they just adorable? 7. Biscuit Pizza Crust. This got popular from being posted here on Huffington Post. And why shouldn't it be popular? Instant pizza faster than even the delivery boy can fork it over? I think yes. 6. Funfetti Whoopie Pies. They seem more like cookie sandwiches to me now, but whoopie does sound a little more exciting. And the fact that they have that buttery funfetti cake batter flavor made from scratch is pretty exciting. WHOOPIE! 5. Caprese Grilled Cheese. I think the cheese speaks for itself here. You can get really crazy and use fresh mozzarella if you feel like making the world chant your name or anything. 4. Chocolate Peanut Butter Mug Cake. Admit it. We all have chocolate emergencies when that stale candy bar you found in the back of the cupboard just isn't gonna cut it. Peanut butter can only add to the bliss. 3. Caramel Toffee Crunch Cheesecake. I think this one is popular for obvious reasons, including caramel, Heath bits, and chocolate. At least I don't think the fact that I ended up smashing the whole thing on the floor was a contributing factor. 2. Copycat Auntie Anne's Pretzels. 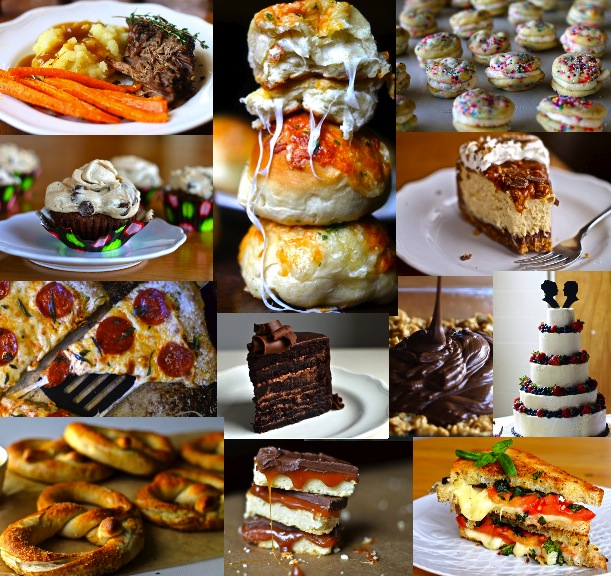 These were the 9th most popular post on Foodgawker this year. I guess this means I'm not the only one who pays homage to Anne, the patron saint of pretzels. 1. Peeta's Stuffed Cheese Buns. I always thought that these were pretty awesome, but then The Pioneer Woman pinned them. THEE Pioneer Woman. HELLO. I love you. Well, that's all for now. What would YOU like to see on Yammie's Noshery in 2013?